Today, my friends, is National Cheesesteak Thursday. Started back on Thursday, March 24, 1994, by four high school classmates of mine, this is a day to celebrate with some quality ribeye, an Amoroso roll, and your choice of American, Provolone, or Cheez Whiz. Just never Swiss. That mistake cost John Kerry the White House in 2004. In honor of NCT, and because out-of-towners often ask me, “Eric, what’s the best cheesesteak in Philly,” I’m gonna rank my Top 5. Heck, I’ll do you one better. I’m going to rank the Top 5 sandwiches — any sandwich — in Philly. 5. American Cheesesteak “wit” (with fried onions) at Steve’s Prince of Steaks. 4. The Butcher Burger at Butcher & Singer. This is the only cloth napkin establishment that makes it onto my list. The steaks at this place are pretty darn good. But, the Butcher Burger is straight fire. And, because we’re dealing with two buns, it qualifies for the list. 3. 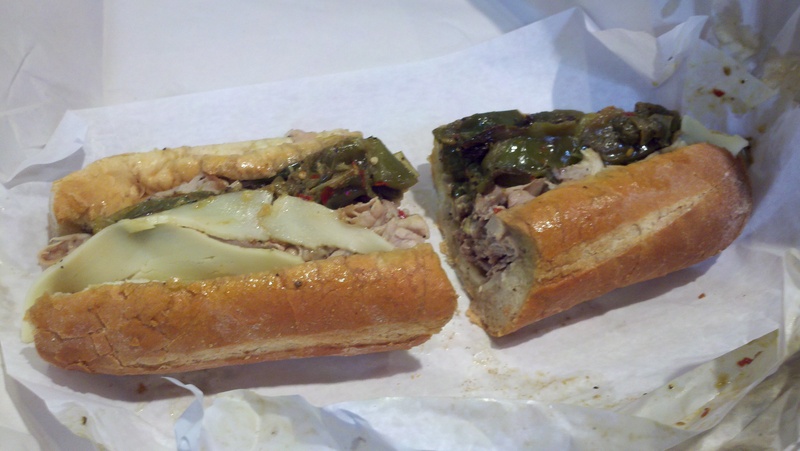 Roast Pork Sandwich with Sharp Provolone and Long Hots at Tommy DiNic’s. This jawn won Travel Channel’s “Best Sandwich in America,” and for good reason. Last year, the ABA Labor and Employment Law Conference was in Philadelphia. One night, they hosted an event at Reading Terminal. Reading Terminal is a huge warehouse with restaurants and other food stands, including DiNic’s. DiNic’s participated in the ABA event and had all-you-can-eat Roast Pork sandwiches. Afterwards, I went home and purchased 24 lifetime ABA memberships for myself. 2. Sharp Provolone Cheesesteak “wit” at John’s Roast Pork. Unfortunately for me, I was very late to the game with John’s Roast Pork. John’s is not only well off the beaten path in South Philly, but it has odd hours. The website lists them as 9-7, Monday through Saturday, but I can remember when it was just weekdays and the grill shut off at 1 pm. Well, if you were fortunate enough to make it in before then, you could die happy after having consumed one of their roast pork sandwiches. Or, you could enter nirvana with a mouthwatering made to order cheesesteak with sharp provolone and fried onions on a seeded roll. Gawd damn is that sandwich good! 1. 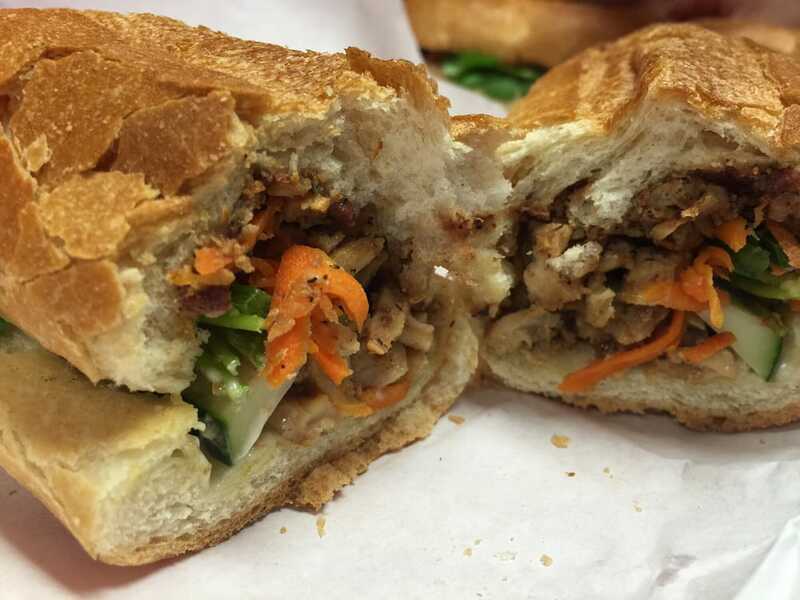 The #8 (Banh Mi Sandwich – Tofu w/ Mushrooms and Onions) at QT Vietnamese. In a city where the cheesesteak reigns supreme, Eric selects a non-cheesesteak as his favorite sandwich. And not just that. This sandwich has no meat in it. WTH! Dudes, let me tell you. Much like my wife until her first bite of that Pat’s Pizza wit, the only reason you doubt me right now is because you don’t know any better. There’s something about the way these soft vegetables marry together with pickled vegetables, cilantro and jalapenos. And then, there’s that house mayo. It’s like crack…I’m told. Plus, it’s all served on this baguette that’s both lighter and crunchier than a traditional hoagie or cheesesteak roll. It all comes together — this wonderful combination of textures and flavors — in an amazing bite, and I’m so walking there for lunch tomorrow. Well, there you have it. Now, you know where to buy me lunch when you come to town. You’re welcome.